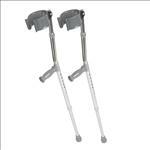 Medline Forearm Crutches; MUST CALL TO ORDER . Telescoping parts are manufactured with internal bushings and external lock nuts to provide totally silent usage. � Vinyl-coated, tapered, contoured arm cuffs. � Heavy-wall, high-strength aluminum tubing. � Tall Adult has a 250-lb. (113 kg) Weight capacity; Patient height, 5'10"-6'6" (178 cm-198 cm). � Adult has a 250-lb. (113 kg) Weight capacity; Patient height, 5'0"-6'2" (152 cm-188 cm). � Youth has a 250-lb. (113 kg) Weight capacity; Patient height, 4'2"-5'2" (127 cm-157 cm).